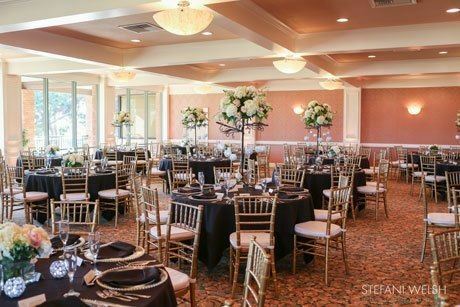 Not only does Costa Mesa Country Club have some of the best golf courses in Orange County, but we also have two of the finest banquet halls too. Situated on the upper-level of our historic brick clubhouse, the Mesa Linda and Los Lagos Banquet rooms possess plentiful space for any event you may have. Both rooms face southward, and through their ample windows, our guest have a gorgeous view of our courses and lush landscape. Not many banquet halls in Orange County can match this. Our Halls are well-suited to accommodate weddings, receptions, anniversary celebrations, theme parties, rehearsal dinners, bridal showers, baby showers, business luncheons or dinner meetings, corporate entertaining, award presentation luncheons and dinners, golf tournaments, fund raisers, or whatever occasion may call for a banquet event.